Testing the pH level of a substance tells you if that substance is acidic, basic or neutral. The pH scale ranges from 1 to 14; 7 is neutral, lower numbers are acidic, and higher numbers are basic. Science experiments on pH levels help investigators determine the pH level of a given material and how that level might affect the environment. These experiments can illustrate important processes such as the effect of acid rain on bodies of water. One simple experiment to get started exploring pH levels involves testing several everyday items you might use at work or home. Collect items such as cleaning supplies, soda pop, water, milk, vinegar, laundry detergent, lemon juice, shampoo, mouthwash or even your own saliva or sweat. Label glass jars or cups with a wax pencil for each liquid you test. Fill the jar 1/3 to 1/2 full with liquid, except saliva or sweat, which can be collected on a cotton swab. Place the tip of a piece of litmus paper or pH indicator paper into the liquid for two seconds; remove the paper and record the color you see. 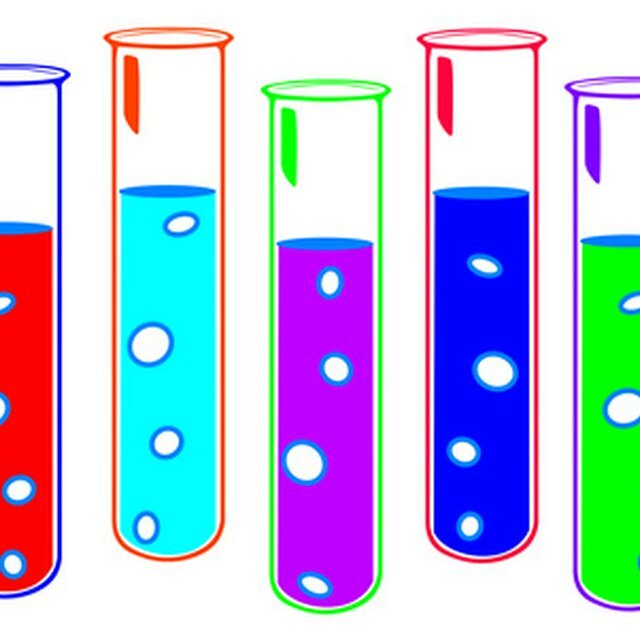 Acidic substances will show a yellow or red color, while basic substances will show blue. Neutral substances appear green. Record and compare your results -- were your chosen substances acidic or basic? Did they differ from what you expected? Using similar techniques, you can test the water supply in your area to determine whether or not it is neutral. Most water supplies have a pH between 6 and 8, but due to acid rain, some bodies of water have lower pH levels, meaning they are more acidic. Collect water from various water sources around your home or collect rainfall in a clean glass jar and secure it with a lid. You can even make a map of where the water samples were gathered. Test each water sample with litmus or pH paper and record its color. Does one area around your home have more acidic pH? How acidic is the rainfall in your area? Many types of soda pop contain acids to enhance taste, and these can have a corrosive effect on human teeth. To study these effects, fill containers with several brands of soda, being careful to put just one type of soda in each container. As controls, fill one more cup with clear water and one with vinegar, which is highly acidic. Measure the pH of the contents of each container with litmus paper and record the results. Place a piece of eggshell in each container. Eggshells are made of mostly the same compounds of human teeth. Notice what happens to the eggshells and record the results. You'll probably notice that deterioration increases with increasing pH, that the eggshells in water suffer no effects. To eliminate any possible effects of carbonation, allow the containers containing soda to sit uncovered for several hours before you add the eggshells. Some soils have substances that buffer -- or act to neutralize -- acids or bases. You can put soil from your own backyard to the test. Collect enough soil to fill a coffee filter. Put the coffee filter in a funnel and put the soil into the filter, but do not pack down the soil. Create an acidic mixture of 2 tablespoons vinegar and 2 cups distilled water. Test the acidity with pH test paper; add water or vinegar until the mixture has a pH of around 4. Hold the funnel over a paper cup and pour the water over the soil. Check the pH of the water that collects in the paper cup. If the pH remains the same, the soil did not buffer the acid, but if the pH level rises, the soil did buffer the acid. Batema, Cara. "Science Experiments on pH Levels." Sciencing, https://sciencing.com/science-experiments-ph-levels-9174.html. 27 April 2018.